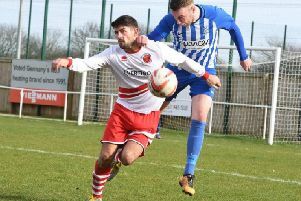 Skegness United returned to Workforce Unlimited Division One action with a 2-1 win at Freiston. December will be an important month for United as they face some of the leading contenders for the title. But first they needed victory over lowly Freiston to start the month off well. Due to late withdrawals, United had to bring in Jamie Sleight and Karl Minor as replacements, and both played an important part in the win. Although United had control of the match in the early stages, it was not until 22 minutes that their first clear-cut chance came. Ryan O’Loughlin was played in but his shot hit the post and went out for a goal kick. Sleight tried a cheeky lob, but home keeper Joey Holland managed to get back on his line and save. United finally took the lead on 26 minutes when good play down the right between Dom Lyons and Keaton Grainger released Anthony Miller who, just inside the home area, fired in a shot into the corner of the net. On 34 minutes United went 2-0 up when a delightful through ball was played into the path of Lyons, who rounded Holland and placed the ball into an empty net. Freiston’s main attacks came down their right, however good covering by United’s back line of Jamie Lyall, Dan Wager, Minor and Miller gave good cover to Alex Kendrick in the visitors’ goal. The second half started with Freiston appearing to step up a gear. However, after 15 minutes they had not produced a shot on goal. The swift running of Callum Barlow, Grainger and Lyons up front were always a constant problem to the home defence. As the half progressed the home side were seeing plenty of the ball, but Kendrick in the visitors’ goal was dealing mainly with long range shots. Sam Sleight was offering good cover to the United defence. The home side got a goal back in the final seconds when a shot from Mark Williams took a wicked deflection and found the net. UNITED: Kendrick, Lyall, Wager, Miller, Minor, Sleight, Lyons, J. Sleight, Barlow, O’Loughlin, Grainger. Hodgkinson’s Man of Match: Sam Sleight. On Saturday United are at home to fellow title chasers Woodhall Spa United (KO 2pm).